David Bowie and The Spiders kicked off a short UK tour at the end of 1972 with a triumphant homecoming show at the Rainbow Theatre, on December 24th. They were enjoying much greater chart recognition since previously being in the country and The Jean Genie had just entered the Top 20 on its way to #2 in the UK single chart. David recalled this batch of shows and the Rainbow gig fondly in Mick Rock’s book, Moonage Daydream: “We put in a short tour of the UK between December and January 1972-73. It was always a great buzz to come back home and this was probably one of the best, highest energy jaunts of our short eighteen-month life. That's all it was, 18 months. Indeed they did, as Andy Barding of Cygnet Committee (http://smarturl.it/CygnetCommittee) points out in this excellent celebration of the night, with contributions from Woody Woodmansey. … and in a North London concert hall David Bowie was making it a night to remember. And not just for his fans. The very next day, Christmas morning, the goodwill mountain of toys and games that had stacked up in the venue’s foyer was distributed to appreciative youngsters in children’s homes across London. David was delighted. His father, who had passed away three years earlier, had been a public relations officer for Dr Barnardo Homes. So this was a cause close to his heart. This sold-out Rainbow concert marked a triumphant homecoming for 25-year-old David and his band, the Spiders from Mars. They had just returned from nearly three months on the road in America and their absence from Britain had made homegrown hearts grow a lot, lot fonder. NME writer and seasoned David Bowie concertgoer Charles Shaar Murray was taken aback by the frenzied audience reception. “Just for the record, they've started screaming at David Bowie,” he wrote. Rival music paper Melody Maker hit the newsstands with a David Bowie-dominated Christmas issue that same week. David was crowned their ‘main man of 1972’, and voted Top Vocalist in the end of year poll. The ‘Rise and Fall of Ziggy Stardust and the Spiders from Mars’ album, which sold close to 200,000 copies in the UK and US during 1972, was declared the MM critics’ choice. Those who attended the Rainbow were treated to a spectacular new live set kicked off by ‘Let’s Spend the Night Together’ (featuring David playing his new VCS3 Moog synthesizer). And as a bonus attraction they were the first in Britain to hear new boy Mike Garson on piano. This was quickly followed by a “razor-edged” ‘Hang On To Yourself', which Charles Shaar Murray enthusiastically reported was “played better than I've ever heard it.” And this in spite of David having only just got over a bout of Asian flu. In a radical break from the regular Ziggy show format, this festive concert did away with the half-time acoustic section in favour of an all-out electric experience. Let’s hope it was all worth the £2.50 ticket price (£1.50 for a cheap seat in the Circle). The concert ended late and, this being Christmas Eve AND the early seventies, night buses and trains were few and far between. By the time the gig ended with ‘Rock ’n’ Roll Suicide’, all underground train services had stopped. Most Bowie freaks had to either walk home or shell out for taxis. At least one silver lame-clad fan spent the night curled up in a Finsbury Park shop doorway. It’s worth clarifying that this was the only London concert by David and the Spiders in December 1972. When Christmas Eve tickets sold out pretty much instantly, efforts were made to book the venue for an extra show on the previous day, December 23. But ultimately it could not be done. There were dramatic scenes at the stage door, as the band made their way out that night. Woody: “I do remember the fans outside the stage door when we exited. We had to actually push one over-enthusiastic fan who was brandishing a pair of scissors. Afterwards, David headed for his South London home (where six Royal Mail sacks full of Christmas cards were waiting for him) and the Spiders were driven home to Yorkshire in a limo - though not by MainMan bodyguard Stuey George, as has been previously documented, says Woody. “It snowed all the way and we arrived at my mum’s in the early hours and surprised them,” he said. 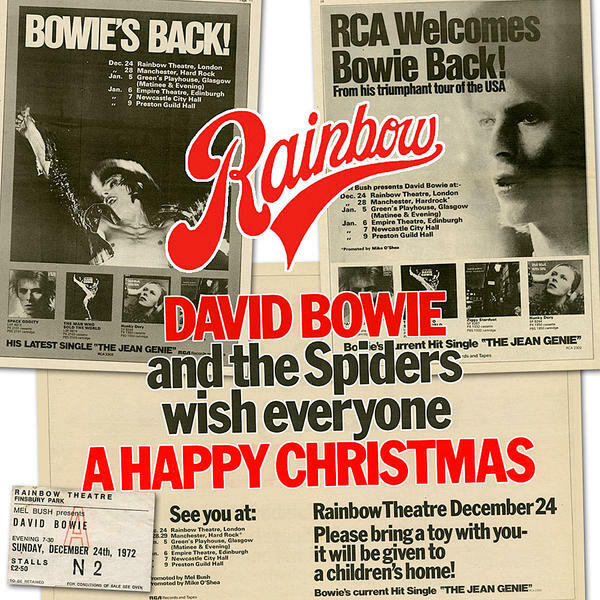 And on Christmas Day, as hundreds of London kids unwrapped surprise presents from those generous David Bowie fans, the rest of the country settled down in front of their tellies to watch the traditional Christmas Top of the Pops – and a repeat showing of that now-legendary ‘Starman’ performance. 1972 had been a super-stellar year for David and the Spiders. And that Christmas, for a lot of reasons, can be considered the icing on the cake. Thanks Andy and Woody, much appreciated. *Of course, the original lyric is stolen, but it seemed somehow appropriate to tweak it to Stollen, a traditional German bread usually eaten during the Christmas season.